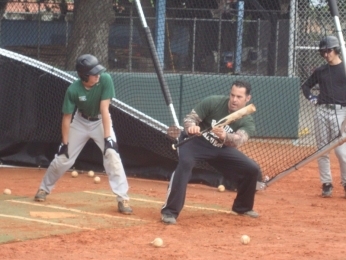 Manager Steven Suarez (center) gets hands-on during practice at the Boys and Girls Club in Coconut Grove. Third year Ransom Everglades Manager Steven Suarez has a team that truly embodies the term “student-athlete”. Ransom is one of the premier academic institutions in Miami-Dade County, where graduates regularly attend Ivy League schools like Harvard, Cornell, and Columbia. The baseball team is no exception, as its two seniors from last season went on to attend Cornell and Michigan for their academic prowess. Suarez is trying to build a team that can be as sharp on the baseball diamond as it is in the classroom. The Raiders have never won a state title in baseball in the Coconut Grove school’s 111-year history, and he is slowly trying to build the team into a consistent winner. Sports is often put on the back burner at Ransom because of how much they stress academics. While kids at other schools may go to hangout with their buddies after practice, many of his players head straight home to hit the books. Lanster boasts a 3.9 unweighted GPA, and he dreams to study engineering at Harvard, Columbia, or Stanford. Suarez admits its not always a walk in the park for his players that are trying to excel in the classroom and on the field. The challenge to find time for both is difficult. Ransom Everglades players work on pickoff drills during practice at the Boys and Girls Club in Coconut Grove. A former infielder in the Colorado Rockies organization, Suarez is a perfectionist on the baseball field. When players come to practice, their schedule and responsibilities are posted in the dugout of their home field at the Boys and Girls Club in Coconut Grove. Every drill is geared towards perfecting technique and each repetition is vital for helping his team get better. “Basically we preach on doing the little things right and we’re big on effort, hustle, and attitude,” Suarez said. Ransom is coming off of a 7-15 season that ended against eventual District 4A-15 champion LaSalle in the district semifinals. The Raiders have moved up to 4A-16 where the competition is just as solid. The group includes Coral Shores, Gulliver Prep, Key West and Keys Gate Charter. The squad also competes in the South Florida Baseball Conference with Miami Country Day, Archbishop Curley, Marathon, Palmer Trinity and Coral Shores. The conference was established to give schools that aren’t baseball powerhouses a competitive league to compete in. “Its competitive games and its great for my players. These teams are just the same caliber as we are and the games are fought to the end,” Suarez said. The Raiders will use a small-ball approach in 2014, where precise execution on offense is the key to be successful. Ransom does not boast many power hitters so the team will have to move runners over the hard way: being smart on the base paths and coming up with timely hits on scoring opportunities. Lanster (.377 B.A., 20 R, 12 RBI, 3 HR), senior infielder/pitcher Matthew Heisenbottle, junior shortstop/pitcher Chris Rossi, and senior third baseman/pitcher Caleb Bush will lead the Raiders on the diamond. “Chris Rossi got a little overshadowed last year but he’s been improving a lot, ” said Lanster. On the mound Rossi will be the ace after going 4-2 with 24 strikeouts in 33 innings pitched last season. Junior pitcher Royevan Armas transferred to Doral Academy, so players like Bush, and sophomore left-handed pitcher Ryan Moralejo will have to pick up the slack. 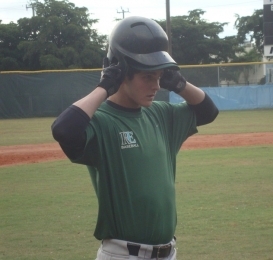 Junior Catcher David Lanster led the Raiders in batting statistics and boasts a 3.9 unweighted GPA. A number of other underclassman will also have a chance to earn playing time this season. With only 600 students enrolled in the high school, the team battles with depth issues. The coaching staff decided to promoted four eighth graders to the varsity to solidify the roster. In addition, many players also compete in multiple sport throughout the year which hinders their growth on the baseball field. Ransom only won two consecutive games in one instance last season, so the coaching staff has stressed playing with consistency in practice. “Last year we had our ups and downs but we’re trying to level it off to stay consistent throughout the year,” Lanster said. No matter how the Raiders finish this season, all of them will likely attend a prestigious university for something other than baseball.